Birth Doula Willow begins the N.C. Chapter for Shaken Baby Syndrome…..
With the rise of Shaken Baby Syndrome which kills on average 1-4 babies in the United States daily mortality and thousands injured yearly, I believe it is important for the birth support team and hospitals to acknowledge that not enough is being done to educate parents on how to prevent such tragic events. This is why more hospitals need Doula’s on staff, to help the parents in initial bonding and education of techniques or tricks on baby care and soothing… I believe a DOULA’s role isn’t just birth, but also in service of transitioning to parenthood..
We are currently in the process of registering officially as a 501. Helping Baby Clay An Arden mother of four is using the power of social media to help another local mom and her son, through the power of prayer. It’s an effort going viral on Facebook for an infant still in a coma. The baby is a victim of Shaken Baby Syndrome. The page is called Prayers For A Hendersonville Baby Boy. It’s dedicated to 6-month-old Clay. His mother’s boyfriend, Justin Pate, was babysitting him and is charged with felony child abuse. Willow Arnold says she was heartbroken when she learned about the case and used Facebook to contact baby Clay’s family. She says social media is working. “The mother does see this, the family does, it really touches their heart to see the community crying out to them and saying, you know, we understand and we’re praying, ” said Willow Arnold. If you’d like to get involved with prayer or make a donation, click here. Published: Wednesday, August 7, 2013 at 4:30 a.m.
Last Modified: Tuesday, August 6, 2013 at 9:32 p.m.
A mother of four in Arden is rallying prayer and community support for a baby boy who remains in a “persistent coma” at Mission Hospital. The man accused of putting him in the hospital remains in jail. Justin Andrew Pate, 23, of Old White St. in Mountain Home has been charged with felony child abuse after a 5-month-old in his care was found unresponsive at a home on Dorado Lane July 10. The infant, Clay, was “in full cardiac arrest” when rescue personnel arrived. Clay remains in critical condition. When Willow Arnold first saw the story, she felt compelled to help. Arnold, who is a mother to four children ranging in age from 1 to 7, felt her heart break for a family she had never met. Now she has become one of the family’s staunchest allies and its unofficial spokesperson, keeping a caring community up-to-date about Clay’s fight for survival. Clay has beaten the odds so far, surviving when medical professionals have doubted his prognosis, but if he recovers, he has a long road ahead of him. Arnold said Clay has been taken off of a ventilator and is now breathing on his own, but he remains in a “persistent coma.” Wrapped in a blanket, with socks over his feet and hands and a cap on his head to keep him warm, Clay has not been able to regulate his own body temperature. Investigators say that on July 10, Clay’s mother left him with her fiancé while she went to work. She never saw this coming, Arnold said. Arnold said doctors have done just about all they can do and may soon send the baby home with caregivers, where he will remain in a coma until he wakes up or “the unthinkable happens” and he never wakes up. After the story was first reported, Arnold waited for updates on the baby’s condition, but nothing followed. Arnold, who quilts lightweight blankets from home to create an extra income for her family, took a blanket to the hospital for baby Clay. The staff cited privacy laws and she was turned away with her gift, but she asked the nurses to let the family know that somebody cared and was praying for them. A couple of days went by without a word. Arnold said she continued to pray and then decided to rally more prayers through Facebook. 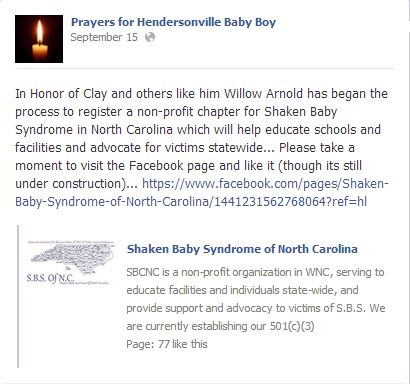 She created the page, “Prayers for Hendersonville Baby Boy,” on July 22 and built a few ads to promote the site. Within 24 hours, nearly 200 people had liked the page. As of 6 p.m. Tuesday it had 589 followers. She said she was expecting 600 by the end of the week. After the site was launched, Arnold said the family contacted her and she met with them two days later to give them the blanket. With the family’s permission, she has posted photos of Clay and several updates about his condition on the site. Arnold organized a prayer vigil, which was held at her church, The River Church in Asheville, on July 25. More than a dozen people signed up to attend. A nationwide prayer chain, she said, now reaches all the way to missionaries in Zimbabwe. “One baby every day dies from Shaken Baby Syndrome and thousands more are hospitalized,” Arnold said. She has researched the syndrome extensively since learning about Clay. With the support of sponsors, Arnold is hoping to have a float to honor Clay in the upcoming Apple Festival parade. She is seeking volunteers to help hand out fliers during the procession. To volunteer, to help in the parade or to sponsor a float or fliers, contact Arnold through the Facebook page “Prayers for Hendersonville Baby Boy” or email Willow_arnold@aol.com. Reach Weaver at emily.weaver@blueridgenow.com or 828-694-7867……………………………..
Watch the NEWS 13 WLOS video…. On call availability 24/7 including holidays. Located just a few miles from both Park Ridge and Mission Hospitals!